I look meticulously after my hair which is, luckily, healthy and I barely had any issues with it. To keep its healthy condition, it is important to me that the products I'm using are natural and free from any silicones. 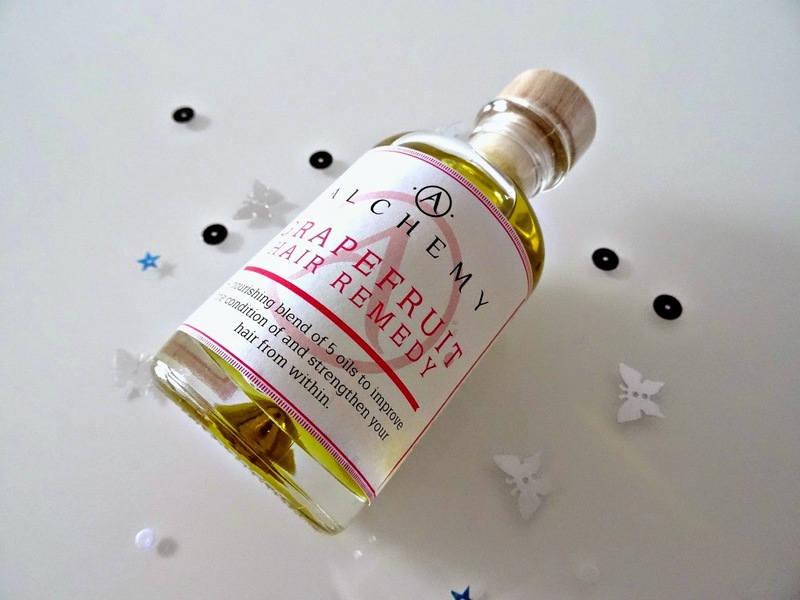 I've recently come across Alchemy Oils Grapefruit Hair Remedy*, which is made of a blend of five oils including coconut, avocado, almond and castor oils to promote growth, thicken hair and impart a shine. 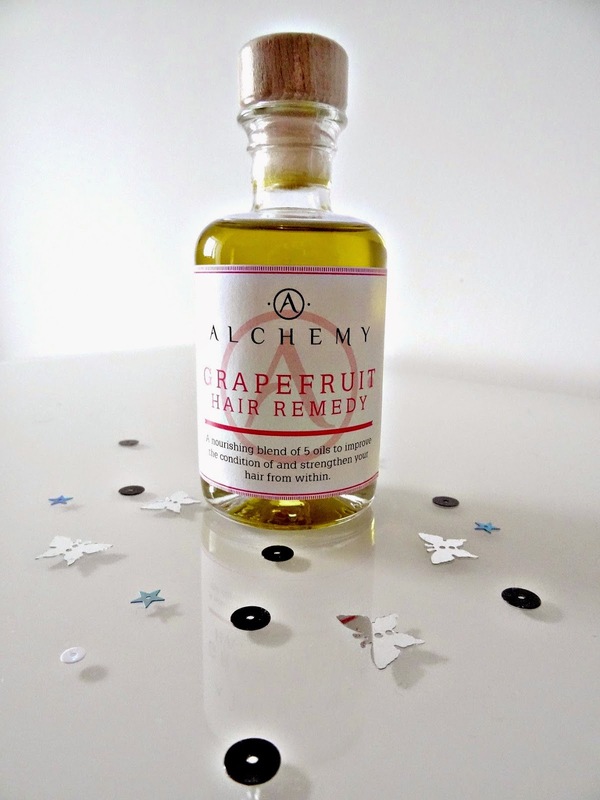 The fifth oil is a citrusy scented grapefruit oil that fights dandruff and further contributes to a healthy end result. I was kindly sent a bottle to try and test the remedy and here's what I thought. The vintage style glass bottle is modern and comes with a wooden cap. It reminds me of bottles used by alchemists in the 18/19th century which reflect the brand’s name and is a wonderful thought, that the brand has brought in here. The cap is solid and seals the bottle perfectly. You can see the shiny, amber coloured oil which goes well in combination with the label’s soft pink colour. Overall the design is wonderful and made a great first impression. This is a product that stands out and I would happily leave it out in my bathroom for decoration rather than to hide away in a drawer. Now the oil has a lovely amber colour and its consistency is not too runny. It has a smooth, but slightly greasy texture (it’s oil after all). My hair is long and thick, so the 100ml lasted for four applications. You can either massage the oil into your damp hair after washing or leave it in your dry hair for at least 20 minutes before washing. I decided to apply it to my dry hair and left it in for some time. On my first application, I found the usage simple and easy. However, when I massaged the oil into my hair from root to end, I thought it felt greasier than for example Argan oil. I might have used more oil in some places than in others and as much as I like the design of the bottle, I think a pump could help to spread the oil more evenly into the hair. During my first use, I left the oil in for around 20 minutes and then washed my hair as usual. I left out the conditioner as the oil already softened my hair and to avoid a greasy finish. When the oil sank into my hair, I was concerned with the greasiness of it and hoped it would not leave a film after washing it out. Luckily, it didn't! The greasiness got less during the washing process and my hair turned out soft and nourished after a blow dry. Every time I moved my head there was a light breeze of the refreshing scent of the grapefruit which felt nice and pleasant. My hair fell and sat nicely, too and had a healthy shine. On my second time, I took a tiny bit more on purpose, plus I left it in for 2h instead of just 20 minutes. I washed it thoroughly and though my hair still turned out nicely, the oil left a light greasy look on my fringe. Though it says on the bottle to let the remedy set in for at least 20 minutes I think you shouldn't leave it in for too long. 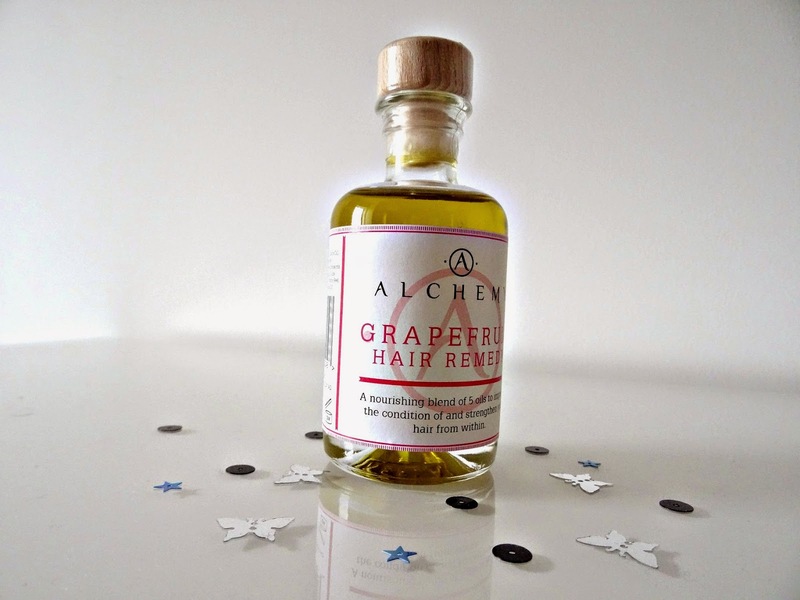 The remedy works and will leave your hair shiny and healthy with the effect lasting a while, so there's no need to apply it every time you're going to wash your hair. The 100ml bottle came £17.99 in 2014 and has been raised in price to a whooping £24. Back in 2014 I found the remedy slightly overpriced but found it to be a great luxury addition to have in your collection or to gift to family and friends for a special occasion. 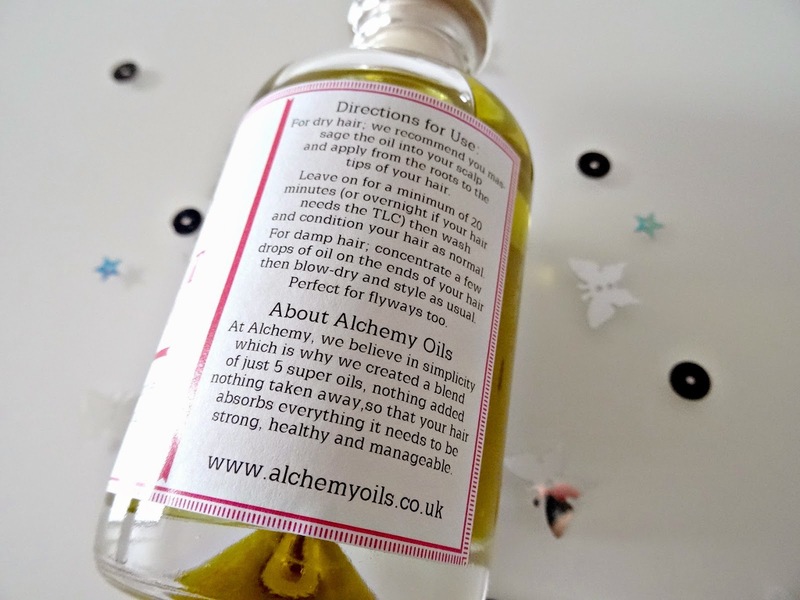 Have you heard of Alchemy Oils before? Have you used the remedy? If not, what's your ultimate hair treatment? Thanks so much for reading and till next time!